New & improved: Folk legend Joan Baez returns to LBC. "That was the nicest thing I've heard about this last album--that it feels like I can slow down and talk now." "I know," Baez interrupts with a laugh, "this mellow, boring . . ."
OK, let's talk about that "How I Spent My Summer Vacation" page on her own website. Here's the new Joan Baez, standing confidently on a mountain trail near Yosemite, hands on hips and clad in a bright red Stetson, sunglasses, blue parka, backpack, hiking boots, and a short girlish skirt. To the right, a second photo shows Baez swirling beside a crystalline alpine lake, beaming brightly in a summer print dress, arms outstretched to illustrate the caption: "Really, you should've seen the one that got away--it was this big!!!" "Oh, so you want to hear the fishing stories," she adds with a chuckle. "What can I say? I like to go to hot springs and play in the mud. It's my way of returning to the earth. And on tour, we're all such good friends, that I can say, 'Hey, guys, let's cancel the hotel and camp out for the night.' They're such great sports--we have cookouts and stuff. "One night the bus driver caught 25 trout while we were onstage." And then there's that legendary Joan Baez, who's not known for pan-frying fish on the roadside. After more than 30 years, the singer/songwriter that Rolling Stone once hailed as "the perfect symbol of the '60s folk revival" still is a committed social activist and popular entertainer, reinventing her performances, garnering a Grammy nomination for 1993's intimate Play Me Backwards (Guardian), and raking in rave reviews for 1997's Gone from Danger, an album that found her drawing inspiration from the pens of such bright young songwriters as Dar Williams, Richard Shindell, Sinead Lohan, and Betty Elders. Coincidentally, that album contained a song titled "Fishing," a vicious interrogation of an illegal immigrant that is far from serene. Two years ago, Baez--who performs July 20 at the Luther Burbank Center--recorded three of Williams' songs and toured the United States and Europe with the rising neo-folk star. But Baez is quick to downplay her role as mentor to a new generation of emerging coffeehouse denizens. "I really see it as co-mentor, because anything else would be silly," she explains. "Now when they're coming of age, it's my turn to learn from them about how they reflect the world. So I enjoy them. I love them. They are people who somehow comfortably, in their own fashion--namely through contemporary folk--keep up the roots of folk music. "Each does that in their own way. Dar is heavily feminist--and hemp--inclined, and Richard Shindell often addresses immigration issues. And he's really subtle. The first time I heard 'Fishing,' I didn't even understand it. I mean, this is certainly not a time for blunt protest songs, so there's a chance for these other things to come out. "And they are coming out." What does that say about the endurance of the genre? "In a way there are two folk musics," Baez offers. "One is traditional and never changes. Someone like Jean Richie does a brilliant show of antiques performed by an Appalachian folkie--and no one does it better. Then there's the folk music that changes as the times change, so that what is being reflected is the political, and not so political, atmosphere around us as interpreted by the younger generation. In an odd sort of way, though it's often hard for me to listen to it, rap may be the most straightforward contribution to folk music at the moment. It comes out of a totally different environment than the one I live in--hungry and frustrated, so the songs come out pissed off. "And they have every reason to be that way." BAEZ KNOWS a thing or two about protest songs. Born in 1941 in New York City, she grew up in a liberal household heavily influenced by her professor father. At age 15, she heard a young Martin Luther King Jr. lecture on non-violence and civil rights. Weeks later, Baez bought her first guitar. The following year, she committed her first act of civil disobedience, refusing to leave her Palo Alto high school during an air-raid drill. That year, she also met Gandhi scholar Ira Sandperl, who became one of her strongest political influences. In 1958, she enrolled at Boston University, immersing herself in music and performing at Cambridge folk clubs. By age 20, Baez already had performed at the prestigious Newport Folk Festival, cut her first album, and met a young Bob Dylan at a Greenwich Village night spot. Thus began a long, turbulent--and often very public--relationship that has played out in sometimes cryptic and, in the case of Baez's 1975 hit "Diamonds and Rust," often scathing lyrical jabs at each other. The two later reconciled. Baez became a key figure in the anti-Vietnam War movement, marrying and later divorcing draft resister David Harris, and performing for and personally urging President Lyndon Johnson to withdraw U.S. troops from the Southeast Asian nation. Since then, Baez has continued her social activism, as the founder of Humanitas International Rights Committee--which played a pivotal role in the evacuation of Vietnamese civilians after the war--and more recently as the first major artist to perform in Sarajevo after the five-year civil war. BUT, WHILE HER songs are still infused with protest, it is a different force that drives her music now. "First of all, it never dawned on me during my lifetime, until these last few years, that I could sing for the sake of singing--it really was about getting something across. So I think it's only fair to say that this past decade has been the time when I cracked the inner kernel of my problems--something I'd worked around since I was 15 years old, but later took on in therapy. And things changed massively for me. One of the things that has changed is the ability to walk onstage with a light foot and sing for the pleasure of singing and the enjoyment of others. "That's a new thing for me, and I've loved it. "At the same time, nothing basically has changed in me. When I walk onstage, I know that I represent 30 years of history. But right now what I'm getting across may be more directed to myself." Which brings us back to those vacation photos and that new Joan Baez, so confident and at ease with herself. "Well, I now think that I have a really good idea what people meant when they used to say to me, 'You look so peaceful.' Of course, I was in absolute turmoil for years, which served the world well. I did what I did and I'm very, very glad of it. "But to rid myself of neuroses and panic attacks and insomnia, and God knows what else, produces that smile I have on my face during those summer vacations." 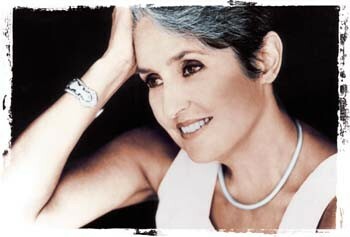 Joan Baez performs Tuesday, July 20, at 8 p.m. at the Luther Burbank Center, 50 Mark West Springs Road, Santa Rosa. Chris Smither opens the show. Tickets are $21.50 and $26.50. For info, call 546-3600. From the July 15-21, 1999 issue of the Sonoma County Independent.